Regulatory authorities are on track to build new accounting standards based on the International Financial Reporting Standards (IFRS), the compliance to which is already required in listed companies and state-owned banks. For many, the adoption of IFRS will be the most significant regulatory change in many years and one with potential to directly impact overall competitive position. The impetus for the change is clear - create a consistent international approach to financial accounting so investors can better compare the financial performance of companies operating in different countries and, by doing so, foster deeper and more liquid capital markets that facilitate economic growth. However, the specific implications for the companies who must transform their financial accounting to accommodate both Vietnamese Accounting Standards (VAS) and IFRS are less clear. Will the adoption of IFRS simply mean companies must undergo a costly technical conversion of their internal accounting processes? Or will the change represent a more fundamental business transformation that leads to greater efficiency and a more competitive position, both domestically and internationally. Or will it be a combination of the two? 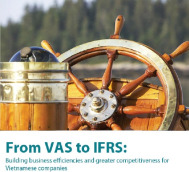 In this whitepaper, we discuss the business process changes that Vietnam-based companies will have to make in adopting IFRS alongside VAS. And we show how these business process changes can make companies operating in Vietnam more competitive, as well as compliant with the IFRS regulation.